Having a baby? There is a new kind of baby registry in town, y’all. When I was having babies one of my most favorite things to do around the halfway mark was to create a baby registry with my husband. We didn’t make one for our last pregnancy since we already had everything we needed, but we did create one for our first two pregnancies. One of the things we noticed, even way back then, was that we had to create multiple registries because we wanted a few things from here, and needed a few things from there. Not only was it an inconvenience to us to have to visit multiple stores to create multiple registries, but I’m sure it was an inconvenience to our friends and family as well who had to shop from multiple registries. I just recently learned about MyRegistry.com, which is a universal registry for any gift-giving occasion, not just baby registries. And no, before the questions begin…I’m not pregnant. I did do some digging around on the site and I’m seriously bummed I didn’t use this when I was registering for baby gifts way back when. I could have added ALL the things I wanted, without settling because it was at a store that offered a registry. Add gifts from any store in the world. Simply install a button on your bookmarks bar to add any product you can find online. Once you find an item you like, click the button in the bookmarks bar and it is added to your registry. Add gifts on the go from your smartphone. 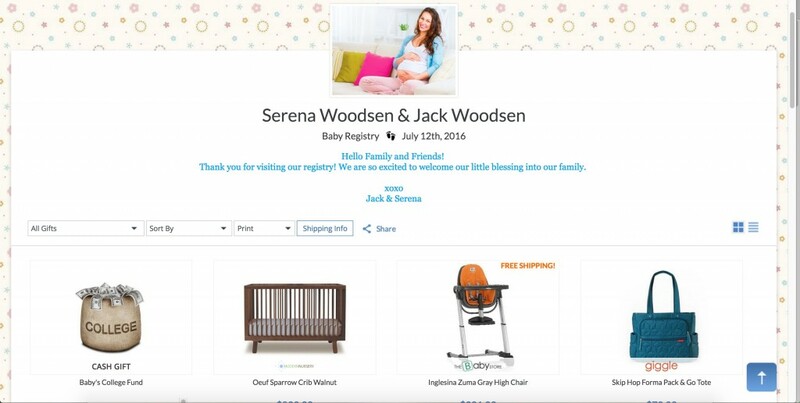 Scan any barcode and add items to your baby registry while browsing your favorite store. Plus, you can add items from stores that do not have websites by taking your own picture and adding a few details about where the item can be purchased. Register for cash gifts. If you prefer cash gifts, you can tastefully register for cash by creating a cash gift fund. This is a perfect option for nursery renovations, baby’s college fund, or any other items/things you can’t register for. Sync the store registries you already have. Import your registries from other stores to create one, universal gift list to make it easier for those buying for you! Easily announce and share your registry. Send beautiful eCards announcing your registry or enable friends to send eCards on your behalf! Personalize your registry’s URL, share your gift list to all your social networks — or go the traditional way and download and print beautiful registry announcements to add to your shower invitations! 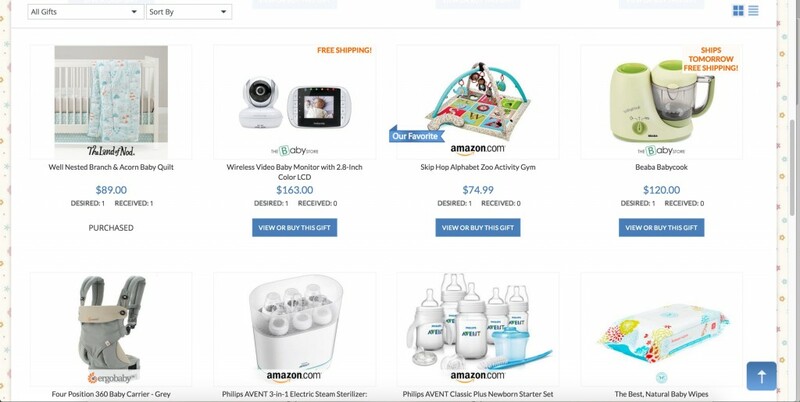 This is an example of how a baby registry would look to people browsing your registry. It includes the baby’s due date as well as a short customized message you can create for your friends and family. 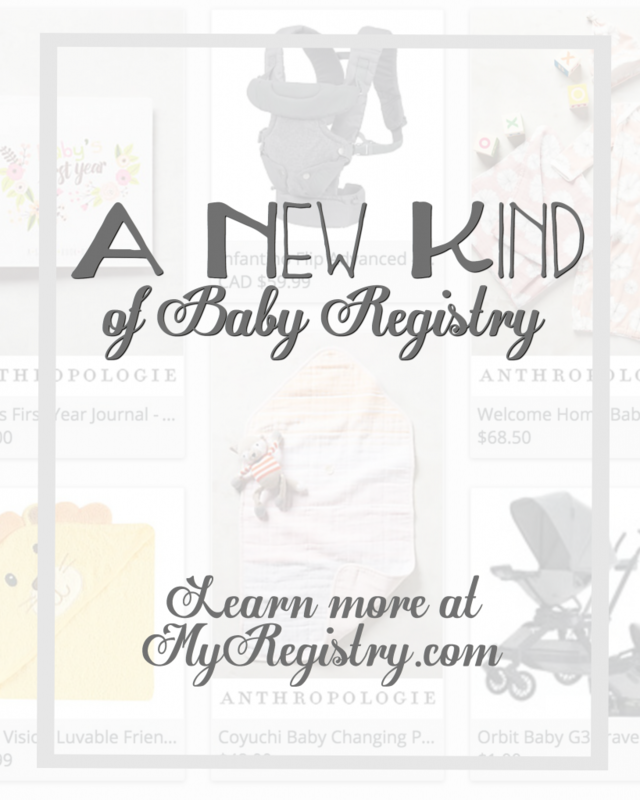 As someone who has created baby registries in the past, I love that this service allows you to add exactly what you want. If you want 15 different items from 15 different stores, the system allows you to do that. You can add everything you want, whether the store has a baby registry or not. As someone who has shopped baby registries in the past, I love that this service allows me to see the price of the item as well as any store incentives, like free shipping. And, if I’m purchasing multiple items, it’s easy to do since it’s online. I don’t have to drive from store to store finding what they want. Like a traditional store registry, the user is able to specify how many of each item they need. When the item is purchased, it will show it as received and the ‘buy this gift’ button goes away. This should really help in expecting parents not receiving doubles. As someone who loves to shop online, these online baby registries are right up my alley. With a few clicks I can buy exactly what they’ve registered for without the guessing game at the store. Easier for me and they get exactly what they want. It’s a win-win! Do you have anything coming up where you could use a registry like this? A new baby, wedding, or graduation? Very cool! I know a few new moms who could really use this. That’s a great way to get yourself all set up for incoming baby days. I have a few pregnant friends I’m going to share this with. Too bad my daughter didn’t know about this earlier in her pregnancy. This seems like a great way to register for exactly what you want and need. The best feature for me is definitely being able to add gifts from many different stores – it allows you to get the best selection. What a great idea! My days of needing a registry are over but I will recommend this to anyone I know who is having a baby. That’s going to revolutionize the registry system as we know it – at least online! Seems so convenient! Very modern updated idea. Just got a new baby in distant family so will check to see if they used this registry. Hip kids in LA & its their first, so most likely. That’s cool to be able to add ideas from any store, not just one. I can see this being VERY handy for expecting parents! This is great. It makes it so much easier for everyone. I will definitely give this a tweet. 🙂 Love this! This is a really awesome idea. I love having everything in one place. I know some pregnant ladies, so I’ll pass this along. I have never heard of this kind of registry before. I have a couple friends who are expecting that will love this. This is pretty cool, never heard it before. This is useful . Expecting a baby this summer so I’m sure I could get a lot of use out of something like this. I haven’t had a registry in years. This is really epic. For normal baby items, this is such a time saver versus schlepping to a store to pick something out. I usually pick out things from the registry anyway so there is no need to go to the store. That’s fantastic! This is so much easier than trying to pick one store or even a few stores. Love it. I wish I had known about this earlier in my pregnancy. It was so hard juggling registries at lots of different stores and websites. This is a great way to make a baby registery! I can’t imagine how hard it would be to remember where you registered for what. I wish I knew this when my little man was a baby, this is so good to make a baby registry. That definitely is handy.I don’t have any baby showers coming up soon but I will keep it in mind! This is great! I will let my friend know. We have a shower coming up in June!